Ever want to pop into the source code of some gem that you are using? In an IDE, you can often get to the source code for a single method, but not as “completely” as with gemedit and TextMate, IMHO. 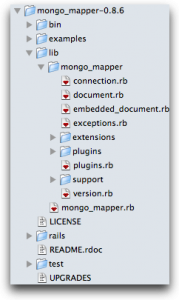 This entry was posted in cool tools, Development, ruby on April 22, 2011 by jon.